We first met Morgan Gary, proprietor of Spin Laundry Lounge, at the tail-end of 2013 when we were commissioned to reupholster her collection of vintage chairs for her soon-to-open Spin Laundry Lounge. At that time, we had no idea that 9 months later, we would be moving from our NW Thurman St. address and be her neighboring business. While there are many reasons that we love our new location on N. Mississippi Ave, Spin Laundry Lounge is definitely one of them. If you haven’t seen this place, you need to! It is a truly unique venue. 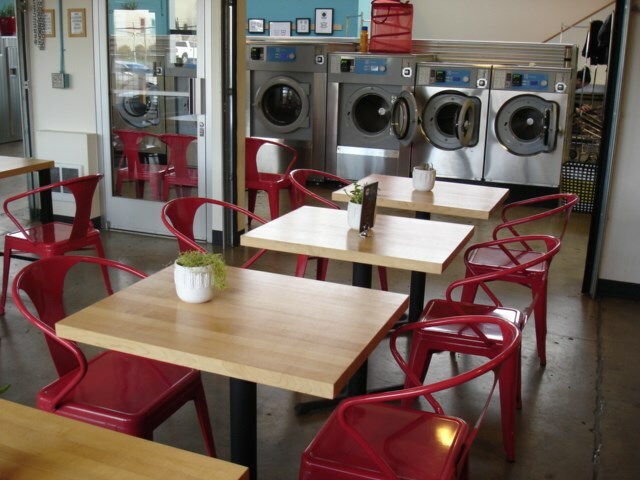 In a nutshell, Spin Laundry Lounge is a sustainably-focused, state-of-the-art laundromat, that also offers beer, wine, coffee, and local eats in a comfy adjoining café. It is now Acanthus’ go-to place when we need to pre-wash/pre-shrink fabrics for our workroom projects, or grab a cup of joe to go!